Employees are expected to make arrangements to balance their work and family obligations. However, if the employer changes the work obligations that makes it difficult for the employee to maintain that balance, it could mean family status discrimination. Canada Post discriminated against a letter carrier when it told her she had to change her childcare arrangements so she could work regular overtime on her route, an arbitrator has ruled. Jessica Weber was a letter carrier for Canada Post in Kitchener, Ont. 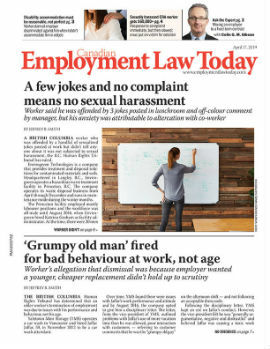 Her union had a collective agreement with Canada Post that included an overtime provision stipulating that “insofar as practicable, overtime on an employee’s route or assignment will be performed by the employee assigned to that particular route.” It was expected that if an employee couldn’t finish her route in the allotted time, she would notify her supervisor and continue until all the mail had been delivered.